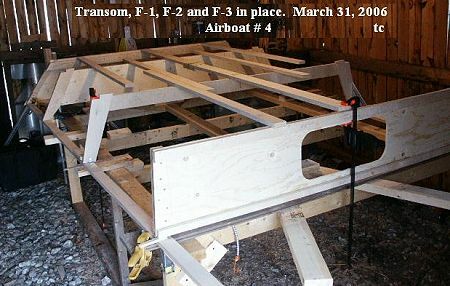 Terry Chapman / Nova Scotia / 2/4/06 GL-400 Airboat: The new project is going well – I think. I have been working on it for three weeks and have a lot completed. 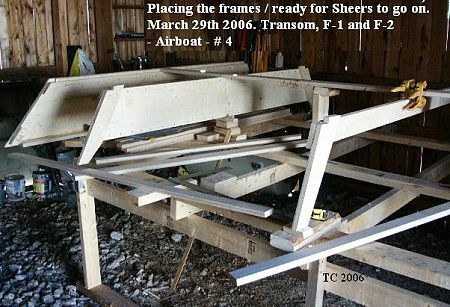 The Transom and frames one and two were built in the winter when it was too cold to think about anything else. 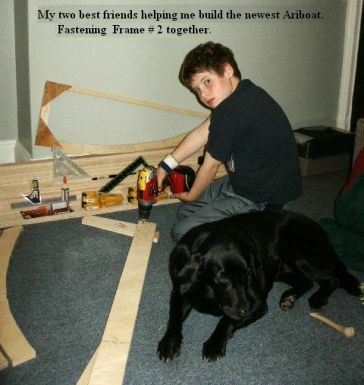 I built one last year (it actually took two years due to moving etc), but I made the bow square. The new one will be rounded off as per the plans, and I think instead of the raised sheer, I will use a bush-guard as the cat-tails here are quite tall and hard. I have some pictures from the last few weeks. I have a few new pictures from the last few days. 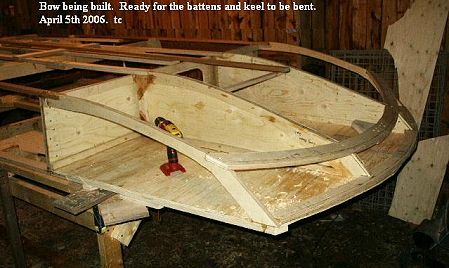 It has been cold here, and the boat-building mode is better when it is warm. I have everything ready for the motor mount plates, and the walls and floor (which I will hopefully get finished tomorrow). By the way, the previous airboat that is also in the registry from a few years ago ( that I was surprised to see still in the registry) is an ok boat; but, I wouldn’t recommend that anyone attempt to change the original design as I did – not even to gain length. The modified hull is strong and carries a lot of weight, but it turns poorly, and does not plane well.